Arkansas show Selva folding bowie. This is for delivery to the Arkansas Custom Knife show. This is my Selva model with a bowie blade. These will all be one off pieces. Folding knives is something you can carry around with you and enjoy using. It can also be called pocket art. You cannot always carry a painting or a statue around with you to show art that you collect but you can always have a nice folder in a small sheath that fits in your pocket, on a blet or in a purse. The Selva comes in the folding bowie style or a folding hunter style. Of course you can order a upgrade field set that comes with both folders plus a large fixed blade knife all sheathed seperate and then all in a leather carrying case. Come by and see the Selva Bowie at the show. 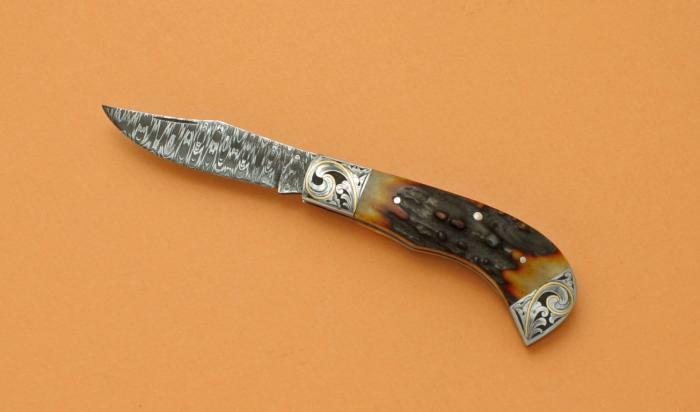 Search Similar Attributes: Selva, folding knife.